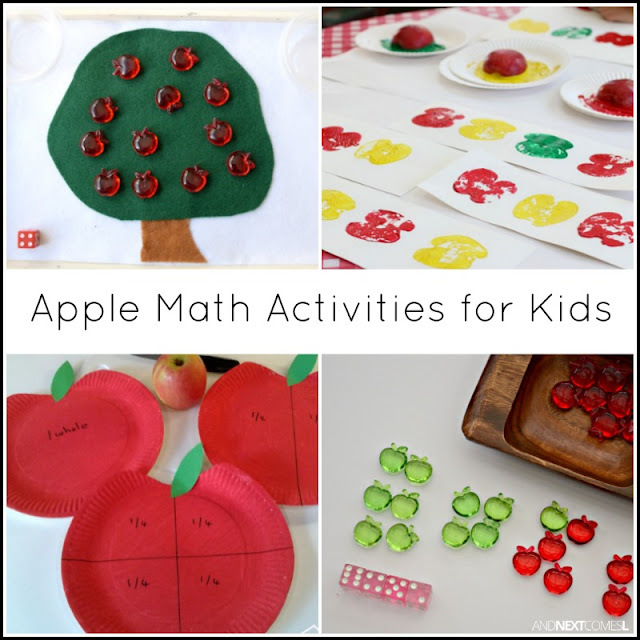 Simple apple themed math activities for kids. Grab some apples because these apple themed math activities for kids are awesome! From counting to greater than and less than to fractions, these math activities are perfect for kids of all ages. So whether you have a preschooler or toddler or an early elementary aged child, these activities will get them excited about apple season and math! 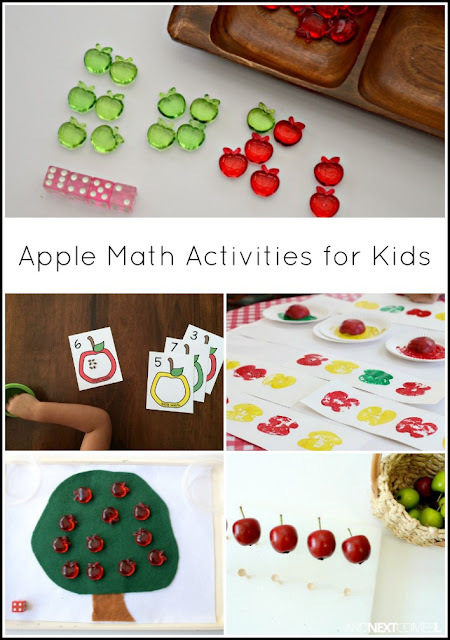 There's even some great free printables included for these apple math activities. 1. Apple Math Tray - Another fabulous simple math tray that encourages kids to add apples. 2. Falling Apples Addition Activity from Fantastic Fun and Learning - Oh goodness, my boys would love this fun apple addition activity! 3. Math Patterns Using Apple Prints from Buggy and Buddy - Combine art and math in this apple themed activity! I know J would love it simply because it looks like traffic lights...haha! 4. Sorting & Counting Apples on the Light Table - Another great fall light table activity! This one encourages kids to sort by color and count the apples. 5. Apple Fractions from Crafty Kids at Home - This activity is a perfect way to teach visual learners about fractions. 6. Fall Apple Patterns from Playground Parkbench - My youngest would love this activity simply because it includes stickers. 7. Apple Ten Frame Fine Motor Math from Fantastic Fun and Learning - This activity combines fine motor and math and looks like tons of fun! 8. Apple Seed Counting Cards from Modern Preschool - This activity would be a great fine motor workout for little ones and is a perfect way to work on counting. 9. Free Number Order Printable Apples from Life Over C's - This free printable is a great way to work on number order. 10. Picking Apples More or Less Math Game from Stir the Wonder - I love this simple apple math game that explore more than, less than, or equal to. It looks like a lot of fun!